According to https://startupbritain.org/ there are just over 27,000 recruitment companies in the UK. Being one in twenty-seven thousand we knew we had to have something to set us apart. We came up with subscription recruitment for many reasons but mainly to be more involved in the business. To truly be a business partner. One of the key complaints about recruitment from clients and candidates is the lack of knowledge about the company from the recruiter. We aim to remedy this. Working exclusively with clients we will get to know their business we will work from the office and be part of the team. Being involved in the office not only means we have a presence to the outside world as your internal recruiter we also have a presence within the company gaining valuable insights into the daily running of the business, culture and ethos etc. These insights prove invaluable when describing the role to a potential employee. Secondly we wanted to look at the cost of recruitment fees. Obviously, there is a cost saving element. If a traditional recruiter charges 20% of the annual salary and the average UK salary is £28,028 this would make the average fee £5605.60. By spreading the cost across the year, we can help with budgeting and cash flow. 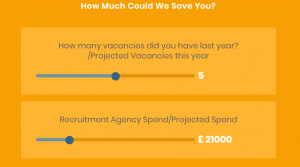 The cost saving element across 4 jobs on an average salary would be £16800. We now pay most things on direct debit to get the best price, phone bill, movies, broadband, music and even beauty products. So why not recruitment? For the monthly fee myinternalrecruiter.com will not only fill your vacancies we will also be a part of the business. Working exclusively with myinternalrecruiter.com we will have a plan a strategy for the following 12 months recruitment making the process seamless, less time consuming and proactive not reactive. If you don’t believe me try out our savings calculator to see how much you could save?